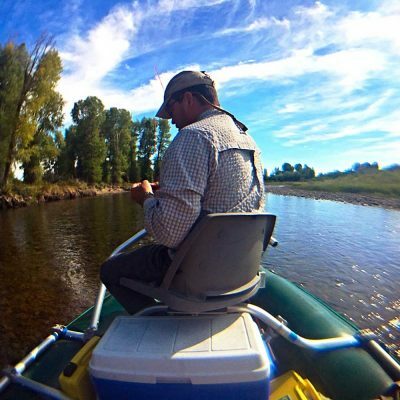 Two Rivers Fishing Co. offers drift boat fishing trips on the Green and New Fork Rivers. We float the Green River from its origin, Green River Lakes, to Fontenelle Reservoir in Western Wyoming. While the majority of our trips are full day floats, we do offer half-day trips and can also customize our trips to fit individual desires. Each trip is set up for the guide and two clients per drift boat. Large lunches and beverages, sure to please any palate, are provided. Fishing trips usually start around 8:00 in the morning. Half-day floats pack a lot of fishing in a short amount of time. Half-day floats can run from 8:00 to 12:00, or from 12:00 to 4:00 (lunch is not provided). Our clients still benefit from our knowledgeable guides’ expertise, experience, and enthusiasm. Beverages and snacks will be provided. In between casts, watch for moose in the willows. 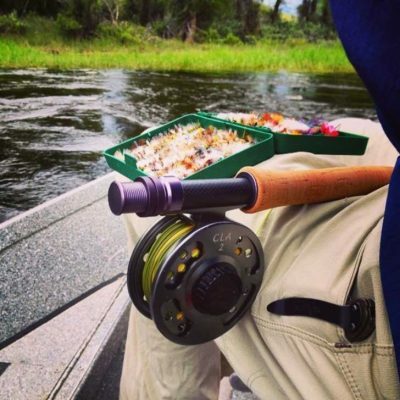 Our full-day floats offer the best of western trout fishing over the course of an entire day. Our trips depart around 8:00 every morning, and the day wraps up around 4:00. Full-day floats include beverages, large lunches, and snacks. Aside from experiencing the world-class fisheries in the area, anglers frequently see abundant wildlife during their float. Seedskadee National Wildlife Refuge holds 26 miles of the finest fly fishing water Wyoming has to offer. Two Rivers Fishing Company works under Wind River Troutfitters, LLC permit to offer guided fishing trips within the Seedskadee Boundaries. This section of the Green River is one of the most highly sought-after stretches of water in western Wyoming. In addition to being a great fishery, the Green River has a rich history-mountain man fur trading rendezvous took place on the banks of the Upper Green from the early 1800s. The Green River can be enjoyed by the beginner and intermediate fisherman, but can also provide a great challenge for the more advanced fishers. The Green has an abundant population of Rainbows from 10- to 16-inches, but the possibilities of catching Rainbows over 20 inches are very common. Browns of 14- to 18-inches are frequently caught, and here again lunkers over 20 inches are available. The Green is also home to Cutthroat and Brook trout. The New Fork River flows out of the New Fork Lakes which are nestled at the base of the Wind River Mountains. With very little public access, this wild trout fishery is a haven for Brown and Rainbow trout in the 14- to 24-inch class. The New Fork is challenging for all fly fishers, but the rewards of trophy trout are great. Fishing this river will be a memorable experience. The New Fork River flows out of the New Fork Lakes which are nestled at the base of the Wind River Mountains. This wild trout fishery is a haven for Brown and Rainbow trout in the 14 to 24 inch class. The New Fork is challenging for all fly fishers, but the rewards of trophy trout are great. Fishing this river will be a memorable experience. Seedskadee National Wildlife Refuge boasts 26 miles of the finest fly fishing water Wyoming has to offer. Two Rivers Fishing Company worked under Wind River Troutfitters, LLC permit to offer guided fishing trips within its boundaries from April 1-October 31. With its abundant wildlife, controlled guiding, stunning views and big tailwater trout, a trip to Seedskadee is a once-in-a-lifetime float and Two Rivers Fishing Company can make it happen. This tailwater tests anglers’ skills with dries, nymphs and big streamers. In the fall, Kokanee Salmon run up the river to spawn, earning Seedskadee the nickname “Li’l Alaska.” Contact TRFC to book your trip on this unbelievable section of the Green River. All trips will meet at the shop unless otherwise arranged. How many anglers fit in a boat? Our guides utilize 15-foot, low-side drift boats that will seat two anglers and the guide. Due to the customized nature of the boat, unfortunately there is no way to accommodate a third angler. For a party size of 3, a second boat and guide are required. What should I bring for a day on the water? What should I expect for a day on the water? Expect to have a great day on the water with a knowledgeable, experienced guide. 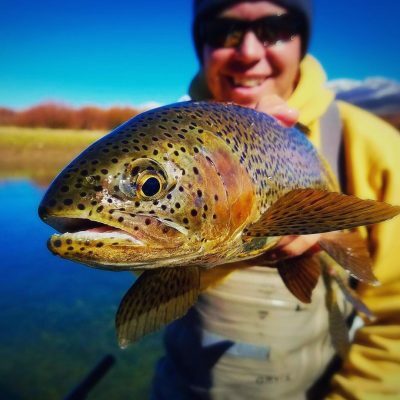 Expect to enjoy some of the most scenic trout waters in the western United States. Expect to come away understanding why Two Rivers Fishing Company is the proven authority on the trout waters in this region. Expect to have a memorable experience. What is your cancellation policy for day fishing trips? A 50% deposit is required to secure a reservation within 7 days of booking your trip. In case of a cancellation, the deposit is fully refundable if the written cancellation request is received prior to 60 days of the trip date. For cancellations within 60 days of arrival, the deposit is non-refundable. Requests to move an already scheduled trip date will be treated as a cancellation and a new booking. Due to the nature of permitting required for our advanced bookings, we can not make exceptions to our cancellation policy. Wyoming weather is often variable-trips will not be cancelled due to adverse weather conditions. If you are at all concerned with the cancellation possibility, we strongly encourage you to purchase trip insurance. Unexpected events do arise and travel insurance is very reasonable. There are many good travel insurance providers, but we recommend Travelguard as a good option. You can either complete the online quote on their website or call one of their agents.